It has been a busy weekend for the Panduit Carrick Wheelers riders. It began yesterday, Saturday, in Birdhill, Co. Tipperary with the Munster TT Championships. This was a 30km TT starting on the outskirts of Birdhill, heading towards Nenagh and back again on what was a very fast course. Ray Cullen, following on from his recent run of form, brought home the Silver Medal in the A2 category with a time of 39:40. In the underage ranks, Patrick O’Loughlin and Tom Kinsella also brought home Silver Medals from their categories, u14s and u12s respectively. There was also another O’Loughlin in action yesterday, but this time it was the turn of Martin. Martin is currently away in Majorca with the National Junior squad but found an opportunity to race all the same, and came away with 2nd place in Alaro. 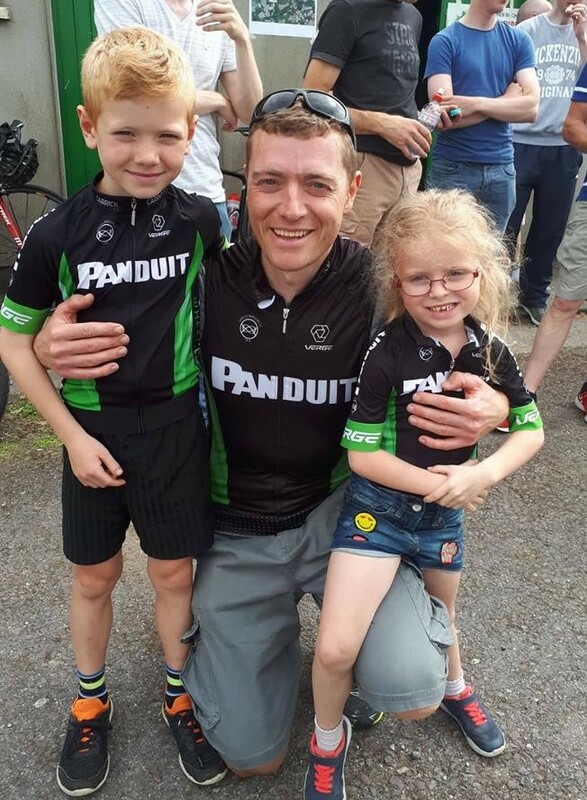 Past club member, Michael O’Loughlin, eldest son of Martin and brother to Patrick, who is now cycling with Team Wiggins, won the Gold Medal and became Munster Champion in the TT in Birdhill so overall, it was a great day for the family. We had a number of riders in action today, this time for road racing; Jamie Blanchfield travelled to Roscommon, for the 3rd round of the Cycling Ireland National Road Series, the Donamon GP. Before today’s event, Jamie was in joint first place in the overall standings. The race was run on a 16km circuit around Donamon with the riders required to complete 7 laps, a total of 112km. Jamie finished the race in 12th place which was good enough to give him the overall lead ahead of Round 4. We will keep you updated as the remaining 4 events unfold, the next one being the Mullingar GP on 15th July. The final event of the weekend was the Velo Revolution GP in Midleton, Co. Cork. Again there were events for the underage categories along with the senior events. The main event here was the A1/A2 race. This race was run over 9 laps, totalling 123km on an undulating circuit. Cathal Purcell was in the first move of the day, having been away in a break of five for the first 4 laps. This was eventually brought back when one of the five suffered a mechanical which affected the momentum of the group. John Hodge was then involved in the next attack which lead to another group of five forming a very strong break. They managed to stay away to the finish line with Hodge claiming 3rd place. Purcell came home in 6th place having been part of a 2-man chase. Darragh Whelan rode a fantastic race in the A3/Junior event to come home as 4th place Junior. In the underage racing, Tom Kinsella took home the 2nd place trophy in the u12 race and Patrick O’Loughlin finished in 3rd place in the u14 event. Overall, it was a fantastic weekend of racing. Well done to all who travelled to compete and their support crews. Congratulations also to Sam Bennett who continued his winning streak today in Germany winning the Rund um Köln.